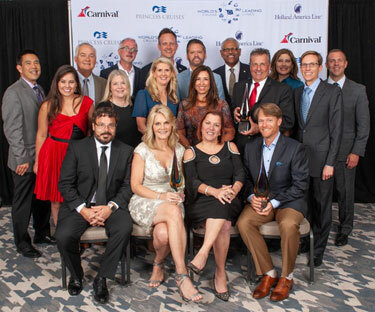 Coral Springs, Fla. – August 22, 2018 – Last week, Cruise Planners won three top awards at the World’s Leading Cruise Lines Excellence Awards gala hosted by Carnival Corporation’s largest brands Holland America Line, Carnival Cruise Line and Princess Cruises. Cruise Planners was the only home-based travel company honored, sweeping the contest winning awards from all three cruise lines. Cruise Planners travel agents continue to increase sales and service clients in ways that consistently prove the value of using a travel agent. Seated front center, Michelle Fee, Cruise Planners CEO and Founder and Vicky Garcia, Cruise Planners COO and co-owner, recipients of three top awards at the World’s Leading Cruise Lines Excellence Awards gala hosted by Carnival Corporation’s largest brands Holland America Line, Carnival Cruise Line and Princess Cruises. Adolfo Perez, senior vice president of sales and trade marketing for Carnival Cruise Line said: "Cruise Planners is consistently one of Carnival Cruise Line's strongest partners, always demonstrating exceptional dedication, hard work and loyalty toward our brand. Congratulations to Michelle, Vicky and the entire Cruise Planners team for winning Carnival's 2018 Franchise Agency Network Excellence Award." Cruise Planners works tirelessly with Carnival Corporation’s brand teams to support its nationwide network of travel agents through the company’s innovative martech campaigns. Cruise Planners doesn’t just provide marketing support for agents, they create multi-touch marketing initiatives including everything from direct mail to email campaigns to social media content backed by data intelligence. All of this has been a game changer in the home-based travel industry, making Cruise Planners agents even more successful. Cruise Planners, an American Express Travel Representative, is the nation’s largest home-based travel agent franchise network in the travel industry. Cruise Planners operates a network of more than 1,800 franchise owners who independently book vacation and travel experiences for their clients. Headquartered in Coral Springs, Fla. since 1994, Cruise Planners supports its network of franchise owners with innovative marketing, booking and technology tools, professional development and training with the industry’s top executives. Cruise Planners and has been named the No.1 travel franchise by Entrepreneur magazine for 15 consecutive years and was recently featured in Entrepreneur as one of the top 30 franchise innovators in technology. Consistently named as one of the Top Women-Owned Businesses by the South Florida Business Journal, Cruise Planners is on the Inc. 5000 list as one of the fastest-growing private companies in America, has been ranked as the #1 travel franchise by Franchise Business Review for 6 years and is recognized as one of the Top Workplaces by the Sun Sentinel. Cruise Planners has achieved top producer status with every major cruise line including Royal Caribbean International, Norwegian Cruise Line, Princess Cruises, Carnival Cruise Line, Celebrity Cruises, Holland America Line, MSC Cruises, Viking Cruises, Uniworld Boutique River Cruise Collection and Regent Seven Seas Cruises, as well as many land vendors such as Travel Impressions and Sandals and Beaches Resorts. As an American Express Travel Representative, Cruise Planners maintains a reputation for quality and offers exclusive American Express Travel benefits such as Pay with Points. Cruise Planners has earned the American Express Travel Representative Excellence Award since 2004, as well as numerous marketing, technology, franchise and philanthropy awards including an International Franchise Association FranTech award for innovation, Magellan Awards from Travel Weekly and Travvy Awards from travAlliance media. Cruise Planners celebrates diversity and supports are troops as one of the Top 50 franchises for Veterans according to GI magazine, the Top Franchise Brand for Veterans according to Franchise Business Review, one of the Top 25 franchises for African-Americans by Black Enterprise magazine and a member of the International Gay & Lesbian Travel Association.